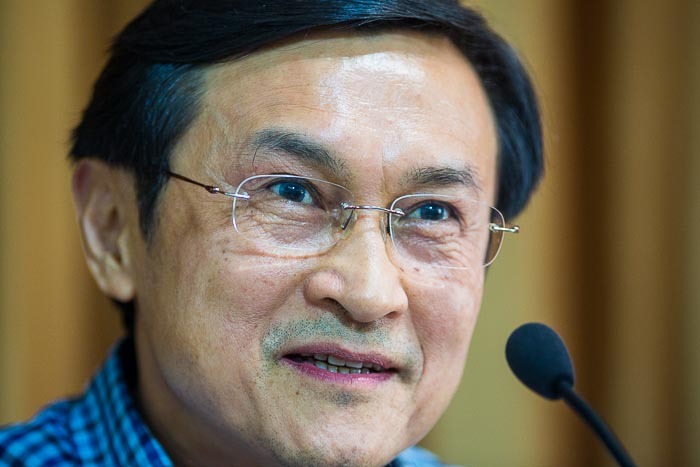 Chaturon Chaisaeng, former Deputy Prime Minister and Education Minister in the Pheu Thai government, the elected civilian government ousted by the Thai army last week, answers questions at a press conference Tuesday. One of the first things the leader of the coup that ousted the Thai government did was to order all of Pheu Thai leadership to report to the army. Most did so. Some have been released, under orders not to talk to the media or travel, and some are still in army custody. Chaturon Chaisaeng is a long serving Thai politician and veteran opponent of Thai coups of the 1970s. He was a Deputy Prime Minister and the Minister of Education in the last government. Chaturon said he did nothing wrong and that the coup was illegal. He disobeyed the army and went into hiding. He surfaced Tuesday in a hastily called press conference at the Foreign Correspondents' Club of Thailand. Chaturon started by saying he had about 90 minutes and then read a long statement explaining why he didn't report to the army and why he thought the coup was illegal. He took some questions from Thai and foreign reporters and then agreed to meet with some reporters for one on one interviews. About 95 minutes after Chaturon started, group of soldiers burst into the room just as the one on one interviews were starting. Under the glare of television lights and pops of flashes they pushed to the front of the room and asked Chaturon to stand. There was a brief, reasonably cordial, back and forth in Thai and the soldiers surrounded Chaturon and pulled him out of the crowd, while hundreds of journalists tried to get photos and shout questions. 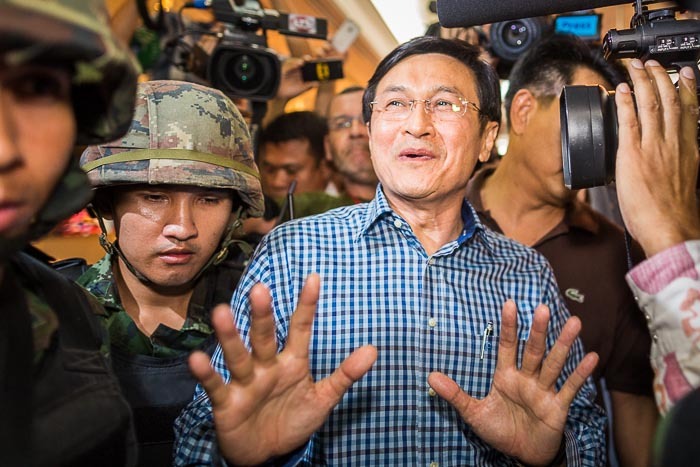 Chaturon tried as best he could to answer questions while soldiers pulled him away. He never stopped smiling and stayed upbeat the whole time. A group of foreign photographers, who have parachuted into Thailand with no understanding of what is going on here, started laughing and a Thai army officer screamed at them, "this is not funny, this is not funny!" Soldiers led the political figure, a veteran of the insurgencies of the 70s (he faced arrest after the 1976 coup and spent time in the jungle with anti-government insurgents) to a waiting van and sped him away. The last we saw of the Education Minister was a door being shut as the van revved its engine. An affable Chaturon is led away. There are more photos of Chaturon's apprehension and the anti-coup protest in my archive or available from ZUMA Press.